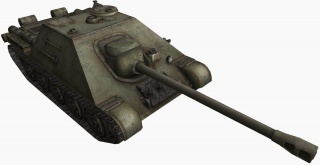 The SU-122-44 is a Soviet tier 7 premium tank destroyer. El desarrollo se inició en junio de 1944 por la Oficina de Diseño Uralmash. El vehículo estaba basado en el chasis del T-44 y tenía una configuración convencional, con la colocación al frente del compartimento de combate. En octubre, el Comisariado del Pueblo para la Industria del Carro de Combate consideró el proyecto SU-122-44. En diciembre el diseño del proyecto estaba listo. Sin embargo, se prefirió al SU-100M-2 con la colocación trasera del compartimento de combate. 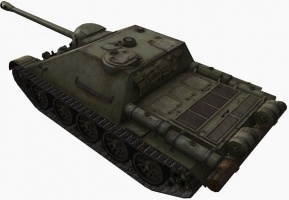 Despite being a premium tank, the SU-122-44 boasts extremely high DPM, has an excellent angled armor for its tier, excellent mobility and speed, and great ammo capacity. The SU-122-44 is also an amazing brawler and can outbrawl almost any tier 7 or lower tank. Good top speed and great maneuverability, hard to flank and makes it an excellent flanker (by TD standards). Superior to the contemporary SU-152 in all but RoF and HP, amazing credit maker even for a premium tank. Great camouflage values, adding sixth sense helps keep you hidden immensely. Bothersome aim time and below average accuracy, limits medium to long range sniping. Rather expensive ammunition. Combined with high rate of fire, the gun can burn a lot of credits very quickly. No preferential matchmaking (still meets tier 9 tanks), penetration is lacking against high tier heavies with weak gold ammo. 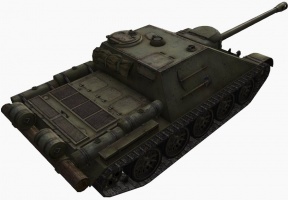 With a gun that's for all intents and purposes as good as the SU-152's best 122mm gun (7.5 to 8.11 Rate of Fire), this tank has one of the best damage per minute values in the game, combined with a low, sneaky profile and high maneuverability, and a bit of sloped armor to boot. A scary tank to face, this premium tank is atypical for premium tanks for having an amazing gun while keeping the benefits of a normal tank. This has made the SU-122-44 to be considered "overpowered" by many players, and a ludicrous credit maker (especially with premium time added into the mix, one can make 50K if they deal at least 1.5K damage and win). Although the SU-122-44 has an extreme DPM and quite good armor, it still is fragile due to its low health and reliance on sloping - artillery will annihilate you, often times in one shot. To make the situation worse, most tier 8 and 9 heavies you find will laugh as you bounce your fairly low penetration gun on them while it takes them two (albeit much slower firing) shots to kill you, unless you can fire at their sides or rear. HOWEVER, if you can fire at their lower glacis, then you can penetrate any tank you fight. Simply put, you can penetrate any tier 7 tank or lower with your gun from the front. For tier 8 or 9 tanks, firing at their lower glacis is almost a surefire penetration. A note of caution for tier 8 or 9 tanks however, it is not uncommon to meet tankers playing this tank while using premium ammo exclusively so one should not get careless and expect to bounce as this tank will punish you for it, but the gun mantlet will absorb most shots that hit it. There is one thing you must note, however. The SU-122-44 gets tracked often, so it is highly recommended to train all crew members in repairs. Development was started in June 1944 by the Uralmash Design Bureau. The vehicle was based on the T-44 chassis and had a conventional configuration, with the front placement of the fighting compartment. 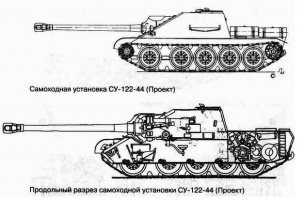 In October, People's Commissariat of the Tank Industry considered the SU-122-44 project. In December the design project was ready. However, the SU-100-M-2 with the rear placement of the fighting compartment was preferred. SU-122-44 Medium Tank at battlefield.ru. SU-122 Tank Destroyer at battlefield.ru. Esta página fue modificada por última vez el 25 oct 2016, a las 13:34.